Mytholmbridge Art Studio, home of Feltgood, is hosting a fringe event during Holmfirth Art Week from 4th-11th July 2015. Keep an eye out for more information about this popular event. The 5 Yorkshire Yurt Panels are now hanging in the Lawrence Batley Theatre until mid April – don’t miss this opportunity to see these 5 meter long felt panels displayed in this wonderful theatre. Sue’s new project – The Yorkshire Yurt for the Tour de France, Grande Départ – has now got the go ahead! This spectacular yurt will be situated in the centre of Holme Village near Holmfirth, from the 30th June until the 8th July 2014. The 25 foot yurt, generously loaned by Yorkshire Yurts, will feature work by Sue Clay showcasing 5 5mx1m hand felted panels depicting the Yorkshire Pennine landscapes, Huddersfield landmarks and the wheels of the Tour de France whizzing by! Sculptures made by children from local schools, colleges and community groups, as well as felted birds from the International Feltmakers Association will be suspended from the ceiling of the Yurt. The yurt will host performances of theatre, film, story telling and music during the week before the race, organised by the Holmfirth Writers Group. There will also be a bar in the yurt serving refreshments and BBQ food available on the 6th July organised by Haute Couture. Sue would like to thank Yorkshire Yurts, Haute Couture, World of Wool, Ramsay Clay, John Chiltern and Frank & Alex Creative Services for their generous contributions to this project. If you would like to sponsor this project and promote your business, please contact Sue on 01484 686642. This important event will receive a huge amount of publicity, so it’s a fantastic opportunity to get your business in the spotlight. Sue is running workshops throughout March, April and May, so if you or your group would like to be part of this amazing project, please contact Sue on 01484 686642. Welcome to FeltGood! My name is Sue Clay and my passion is working with wool in felting. I run regular workshops from my purpose built studio as well as in schools, colleges, community venues and universities. 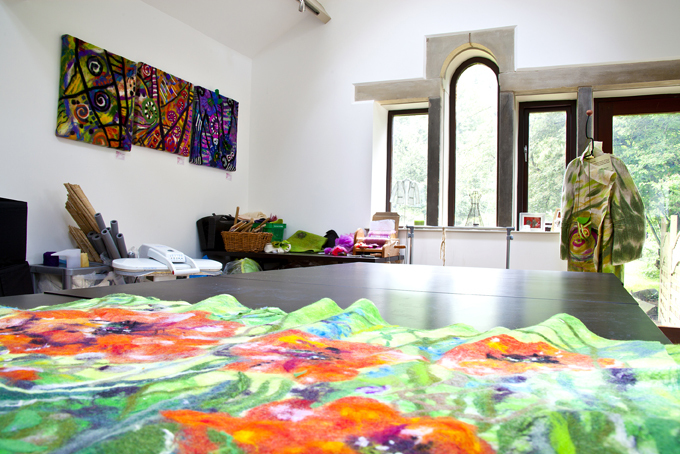 My studio is based at my home, Mytholmbridge Art Studio is a purpose built studio on Luke Lane in Holmfirth where I create all my felt artwork and run some of my workshops. If you would like to know more please email me at suefisherclay@gmail.co.uk or call me for a chat on 01484 686642.